Eggs are all-natural and provide one of the highest quality proteins of any food available and are easily digested and generally preferred over soy protein and just second to whey. One egg yields more than six grams of protein, or 13 percent of the recommended daily value, and nearly half is found in the yolk. In fact, the protein quality in egg whites (a.k.a egg albumen) are so high that they are often used as the standard for measuring the protein quality of other foods. The high-quality and medium digesting protein in eggs helps to build muscles and allows you to feel fuller – longer, while staying energized; which helps you to maintain a healthy weight. In fact, eating eggs for breakfast reduces hunger and decreases calorie consumption at lunch and throughout the day. The protein in eggs provides steady and sustained energy because it does not cause a surge in blood sugar or insulin levels, which can lead to the crashing effect as blood sugars drop. In addition to being a nutrient-rich source of high-quality protein, eggs provide varying amounts of vitamins: A, B, E, K required for the production of energy in the body, and additional vitamins such as: thiamin, iron, phosphorus, zinc, riboflavin, folate, B12 and B6 – which is necessary for the breakdown of fats and to assist in smoother muscle contractions. Eggs also contain all 8 essential amino acids necessary for growth and recovery. Calorie for calorie, you need less protein from eggs than you do from other sources to gain the same muscle building results. In addition to all natural eggs, egg protein powder is ideal for those who are allergic to soy, dairy or milk proteins, and the supplement powder doesn’t have the potential setbacks that the ‘yolks’ in real eggs contain – the added fat and cholesterol. Don’t confuse the yolk in the eggs for being bad now, two whole eggs per day have been scientifically proven to not have a negative effect on your cholesterol levels and to add many nutritional benefits to your diet. Conversely, they also recommend not to exceed two whole eggs per day. If you want more egg protein than two whole eggs yield, they recommend going with strictly egg whites or the powder form so excess fat and cholesterol don’t accumulate. 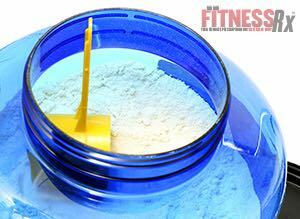 Egg whites contain 10% to 20% more leucine (the most potent part of the BCAA) than most other protein sources. 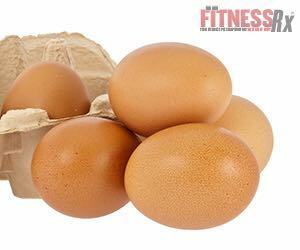 It’s rumored that egg protein was more anabolic than both soy and whey protein. In addition, it’s theorized that it increased lean body mass more than both of those protein sources – even at equal intakes. All in all, regardless of where your source of protein comes from, protein in general is designed to: minimize muscle tissue breakdown, repair damaged muscle tissue, boost protein synthesis, improve glycogen uptake and nitrogen retention, increases muscle growth/strength and fat loss, build up immunity, improve anabolic and anti-catabolic effects, provide a quality source of protein that is lean w/ minimal fat and carbs plus the added availability of additional vitamins and minerals. Please visit the supplement section at Fitness RX for Men for their extensive inventory of products related to egg protein.